One pot recipes are my thang. Minimal effort (chuck ingredients in..leave to simmer for a while) and barely any dishes afterwards, win win! 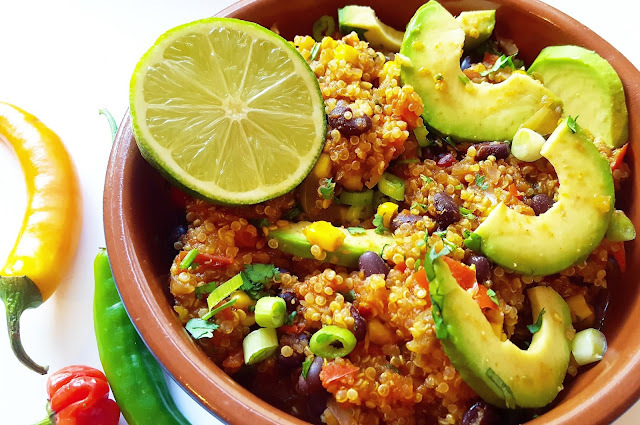 This quinoa dish is deeelicious. I've made it a million times and it's turned out perfect every time - fail-safe recipe. This can be used as a main, a side dish or even as part of a burrito bowl. This recipe yields four portions. Heat up a large pan to medium-high and add onions, garlic and jalapeno. Fry for a couple of minutes until softened. Add peppers and fry for a further 2-3 minutes. Add quinoa, black beans, 'chicken' bouillon, sweetcorn, tinned tomatoes, coriander, chilli flakes, cumin, chilli powder, tomato puree and salt/pepper. Give this a good stir then cover and reduce heat to medium-low. Simmer for 30 minutes then remove from heat.